You might be thinking “Really, Kalen? 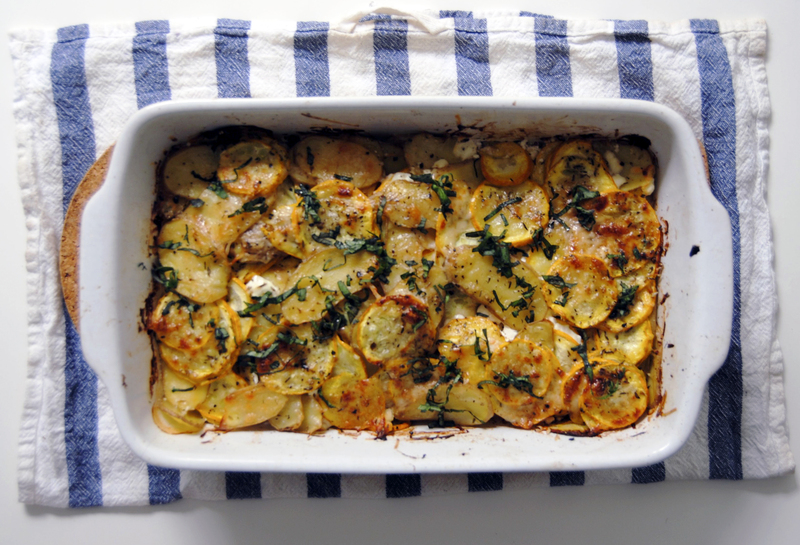 Four recipes and two of them include goat cheese?” to which I would reply “Hell yes!” and then tell you that I could make an entire blog about goat cheese, but won’t, because that would be weird. I love comfort food. In fact, I really love comfort food. I’m all about mashed potatoes, hearty soups, chili and cornbread, cheesy casseroles and anything breaded. What? Extra butter? Bring it on! In the winter, these dishes are ideal because all I want to do is keep warm and hibernate and I don’t even mind putting on a few pounds for extra insulation. In the summer, though, they’re too heavy and warm and just not what I feel like eating when it’s a hundred degrees outside. So of course, in the summer I start eating more fruit, yogurt, salads, sandwiches, and anything that doesn’t require standing anywhere near the stove and won’t make me sweat while I eat it (I’m talking to you, chili). But you know what? That’s no way to live! A girl can’t live on cold food! …I mean, she can, but she certainly doesn’t want to. Every so often I really need a warm, comforting meal, even in the summertime. Something that makes me feel full and satisfied without going into a food coma. Enter goat cheese, and plenty of it. This recipe is great for the summer because not only is it healthy and (relatively) light, but it’s the kind of recipe you assemble in about 5 minutes, throw in the oven and then run far, far away while it cooks. Even better, since the vegetables aren’t drowning in butter and cream, they really keep their flavor and consistency. If I had to choose a favorite kitchen gadget, it would be my mandoline. 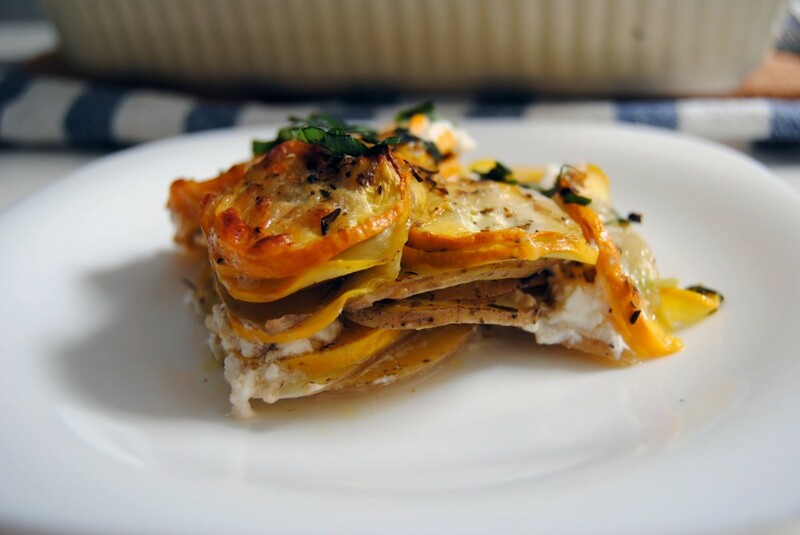 I bought the cheapest one I could find and I’ve gotten so much use out of it, from salads to vegetable lasagna to ratatouille to gratins like this one. It works perfectly for this recipe and really speeds up the process – you could slice the vegetables with a knife, of course, but it would be much more time-consuming. I only very slightly adapted this recipe to include more herbs. The original recipe just called for fresh basil on the top, but I wanted lots of herbs throughout. I recommend using oregano and thyme, but you can substitute your favorites. I confess that I didn’t measure the herbs but I’m guessing it was about a half tablespoon to a tablespoon of each. Just sprinkle them across each layer along with the salt and pepper. Preheat oven to 400ºF and lightly grease a 1 1/2 to 2-quart casserole dish with olive oil. Thinly slice the squash and potatoes using a mandoline or a chef’s knife. The slices should be around 1/8 inch thick. Toss the sliced vegetables with 3 tablespoons olive oil in a bowl. Spread about 1/3 of the vegetables in the bottom of the casserole dish and season with salt, pepper and the dried herbs. Crumble half the goat cheese evenly across the top. Spread another 1/3 of the vegetables and season with salt, pepper and dried herbs again. Top with the remaining goat cheese. Spread the remaining vegetables across the top, and once again season with salt, pepper and herbs. Pour the milk over the dish, and top with parmesan cheese. Bake covered for about 30-35 minutes, and then uncovered for another 15 minutes until it’s brown and bubbly and the vegetables are tender. Top with sliced basil and serve hot or warm. This makes a great side dish or even a vegetarian main course when paired with a salad. EDIT: I’ve realized after talking to a few friends that many people may not know what kind of squash I used here. For my California friends it should be obvious, but for my international friends, here’s a photo. 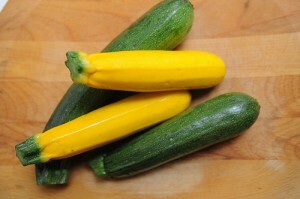 As you can see, it’s very similar to zucchini. Oh I just LOVE your blog! Excellent and entertaining writing as well as fabulous recipes! What more could I ask for? Only that we be on the same continent,!